This October, Rav Michael Laitman, PhD will be touring the United States and Canada giving public lectures and media interviews. 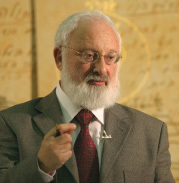 The primary focus of his tour’s message will be the global situation today and humanity’s future, which has been predicted and perceived in the authentic wisdom of Kabbalah since its inception 4,000 years ago. This tour is a follow-up to the success of Rav Laitman’s latest publication, The Complete Idiot’s Guide to Kabbalah (Alpha, a member of Penguin Group (USA) inc., 2007), one of Rav Laitman’s most easy-to-understand and clearly written books on authentic Kabbalah for English speakers to date.